American gangster and bank robber; known as “Public Enemy Number One,” killed by police as he was leaving Chicago’s Biograph Theater, subject of the blockbuster movie, “Public Enemies,” starring Johnny Depp. 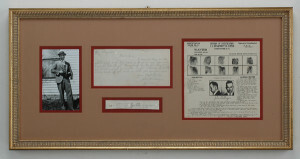 Extremely rare Autograph Letter Signed, “John Dillinger #14395,” one page, small oblong octavo, undated [circa 1929-1933]. Written while in the Indiana State Prison at Michigan City, to prison assistant superintendent, H.W. Waymire. The Indiana State Prison was John Dillinger’s education in crime and his source of future gang members. In 1929, a young man in his twenties, with a history of petty crimes, he had been persuaded to plead guilty for his part in the drunken assault and botched robbery of a grocery store owner from Dillinger’s hometown of Mooresville, Indiana. His long prison sentence (ten to twenty years) embittered him against society. He embraced the prison life-style where he befriended other criminals and was educated by seasoned bank robbers. He and his friends planned heists they would commit as soon as they were released. When he was paroled in 1933, Dillinger’s first thought was to carry out the meticulously planned, highly successful, confounding, sensational prison escape – now the rich material of movie script writers – which freed his buddies, including the notorious John Hamilton, Harry Pierpont, Jack Clark and others, most of whom he knew from the prison laundry. Their crime spree lasted a little more than a year, from May of 1933 to July of 1934, in the fourth year of the Great Depression. With his strange mixture of danger and charisma, John Dillinger captured the imagination of a public infuriated with the robber banks who were seen to have stolen their money first. Dillinger played to his audience which read breathtaking accounts of how he bounded over teller windows like a jackrabbit; how he often stole their delinquent credit records along with the money; how he pretended to be a security investigator the better to learn how to evade the systems set up to catch him; how he lied about making a movie which turned out to be his own robbery. Who could have been surprised that it was as he was leaving the Biograph Theatre in Chicago, after watching a movie (“Manhattan Melodrama,” starring Clark Gable and Myrna Loy), that Dillinger met his end. One imagines he would have reveled in “Public Enemies.” Like Johnny Depp, Dillinger had panache. 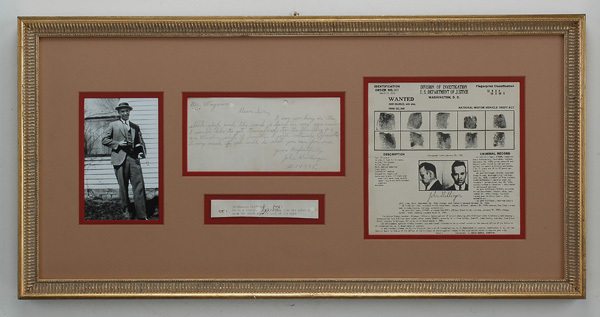 Framed (with an original U.S. Justice Department wanted poster for Dillinger and a full-length photograph of the gangster sporting a straw boater and carrying a machine gun) dimensions: 28 * inches wide by 14 * inches.